Meet Set up – Approximately 5 parents are needed to arrive at the meet 15 minutes prior to warm ups to help set up the pool and score table for the meet. They will help carry equipment to the pool and will help transfer information from the computer generated meet sheets to the manual scoring sheets. We only have 45 minutes to have everything ready to go and we have over 60 events that need information transferred. Meet Check In – Checks in all swimmer so coaches know that everyone is here and posts the tentative events swimmers will be swimming, events are subject to change. Timers – Timers are stationed at the finishing end of the pool and use stop watches and a very keen eye to determine what the swimmers time is for the event. Each lane will have 2-3 timers per lane and each lane will also have a timer sheet that will be used to record the swimmers times. Upon finish of the event the head timer will record the time. The time that is used depends upon the number of timers in the lane. 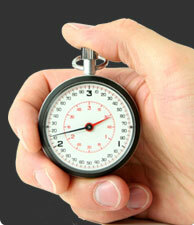 If there are 2 times – the time is averaged between each timer. If there are 3 timers the middle time is used. At the beginning of the meet there will be a timer meeting and the referee will review timing procedures with the timers. Timers should always use their index finger and not thumb to start and stop the watch. Timers should always lean over the edge of the pool to have the best view of when the swimmer touches the end of the pool. Timers should stop the watch when any part of the swimmers body touches the wall. Timers should always pay attention to the number of lengths the swimmer has swum in longer races to insure they completed the appropriate course. This is a great job for new parents!! Runner – The runner collects the official time from the timers at the conclusion of each race. They also collect place cards from place judges when applicable. They return this information to the score table at the end of each race to allow the meet times to be recorded and scores to be tabulated. Place Judge – the place judge stands on the side of the pool at the finish end and records the finish place for each lane. Typically there are 2 place judges who help to determine the race winners. Scorer – Scorers work with scorers from the other team to record times and place for each race and tabulate meet scores when applicable. The place judge will always determine order of finish and more detailed separate instructions are provided for the scorers position. Scorers should also return all scoring materials to the bins provided and return them to Coach Mike’s car before leaving. Computer Operator – During Summer Dual meets the computer operator will enter all results into the meet results database. Since this person will become familiar with the meet manager program we hope that they will take on the opportunity to assist at the score table for our Championship meet. Starter – the starter is responsible for starting each race and insuring that swimmers follow the proper protocol for the meet start. Announcer – the announcer announces the events and swimmers prior to or during the event. Stroke/Turn – These are certified officials who determine if swimmers are following rules when swimming. The officials will be advised by the coaches if we will be DQing swimmers at the meets. This summer they will also observe at all meets with a trainee to help train new officials for the upcoming winter season. Stroke/Turn Trainee – this is an opportunity for anyone who is considering taking the officials training course for the winter season to shadow a current official to get a better idea of what officials are looking for. I encourage you to take advantage of this opportunity. Meet Clean Up – We will need at least 5 parents to help put all equipment away and return to Mike’s car at the end of the meet. So we can all go home. We want to leave the facilities that we are fortunate enough to have the use of in better condition than we found them.